THE FORMER President, Flt. Lt. Jerry John Rawlings has dismissed assertions by the Managing Editor of the Crusading Guide, Mr. Kweku Baako, Jnr. that he hates the first President, Dr. Kwame Nkrumah. Speaking to The Chronicle in Accra on behalf of Mr. Rawlings in reaction to remarks attributed to Mr. Baako about the ex-president's alleged aversion to Nkrumah, the special aide said the assertions by Mr. Baako were malicious and a calculated attempt to malign the former president. Mr. Smith who said the ex-President did not share the ideologies of Dr. Nkrumah, asked: “If the old man hated Nkrumah, how would he choose people like Prof. Evans Atta Mills, Mr. Harry Sawyer and others to work with him, knowing their political lineage as CPP members? Mr. Smith shifted the blame to the NPP, saying Baako's effusions were part of the NPP's agenda to malign Mr. Rawlings with the view to disorganizing the NDC. “It is a known fact that the NPP wanted to knock Mr. Rawlings down so that the NDC would be disorganized. It is totally impossible. “Look, let me tell you today that the NPP did not unseat Rawlings. 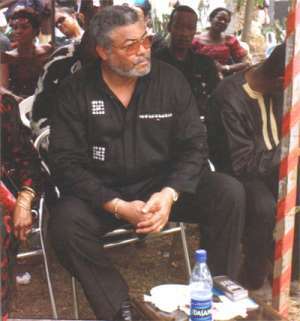 Rawlings' term of office was over and if today, the constitution were varied and Mr. Rawlings stood as a Presidential candidate, he would win landslide. Rawlings is the most popular person ever known in the history of this country for his charisma, courage, selflessness, passion for the common man or better still the under privileged.” He said these attributes were paramount on the minds of Ghanaians. According to Smith, indications on the ground were that the NPP had not only lost touch with the electorate but also lost credibility with its policies and plans. He said it was by divine intervention that the NDC lost power to the NPP to enable the masses to judge between the two parties and assess their credibility and performance. Speaking on other suggestions that the former President was obliterating his name from the Ghanaian history through his utterances and other acts, Smith said the name of Mr. Rawlings would remain forever in history. The special aide justified the celebration of June 4, 1979 revolt saying it commemorated the events which led to the coup in 1981. “We need to learn the history of the past. We need to know that it came about as a result of serious stresses and strains within the political, social and economic development between 1966 and 1979 so that we can avoid future recurrence. Nobody rejoices about the June 4th event. “It is to let the people know that had it not been for June 4th, the nation could have faced a disastrous situation as we see today,” he said. Mr. Baako was reported to have stated that the former President had developed hatred for the first President to the extent that wherever they (Baako and Rawlings) went, the ex-President had demanded the removal of Dr. Nkrumah's picture.